FOLLOWING their success at the English School Track & Field Championships, two Thurrock Harrier athletes proudly represented England on Saturday (21st) at the Schools International Athletics competition held in Grangemouth, Scotland against the best athletes from across England, Scotland, Wales, and Northern Ireland. Theo Adesina won Gold in the U17M Long Jump competition jumping a pb of 7.05m. Funminiyi Olajide, in the U17W Long Jump competition won silver with a pb of 6.07m, Funminiyi so narrowly missing out on Gold. Fantastic jumps from both athletes both of which have set new club records for their age groups. Thurrock Harriers are very proud of them both. 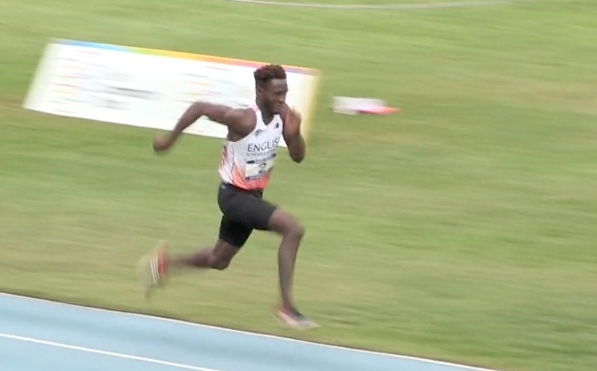 LONG JUMP AT SIAB INTERNATIONAL, GRANGEMOUTH – 21.7.18 – THEO ADESINI OVER 7 METRES FOR THE FIRST TIME from StuMedia on Vimeo.